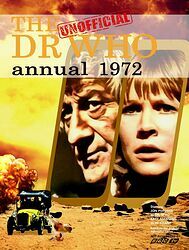 Note: Fan-produced publication designed as a pastiche of the early 1970s Doctor Who annuals by World Distributors — as many fans know, World never produced a Doctor Who annual for 1972 and this book is intended to fill that long-standing "gap". More information on the project's Facebook group. Followed by The Unofficial Dr Who Annual 1987.